I’m one week out from my first hike on the Appalachian Trail and I’m nervously excited! We will be in the Shenandoah Valley area of the AT. I only decided to do this about 5 weeks ago so I’ve been trying to learn as much as I can and prepare as best as I can. 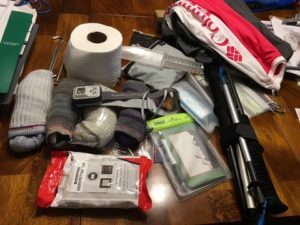 There will be three of us on this trip, me, (Ken Stewart and Kendra Robson) I’m the rookie here as I’ve never hiked or camped remotely for this long, so I honestly have no idea what to expect (or what I’m doing) but here’s my approach/plan. REI is a lifesaver. 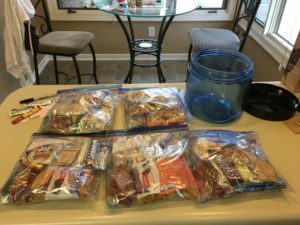 Four weeks ago, when I walked into the REI in Nashville and said, “I’m hiking 62 miles over 5 nights on the AT, what kind of pack should I get?” They walked me over, measured me and offered up a few different options with pros and cons for each (they were probably secretly judging my naivety). 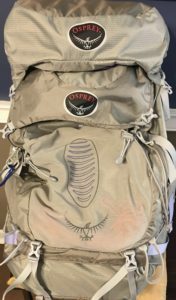 I settled on the Osprey 65 because of how comfortable it felt around my hips. I also like all of the hidden pockets on the pack so small things don’t get lost in the bottom. Additionally, it’s large enough that my friends can stuff me and drag me out if need be. This is a largely debated topic. 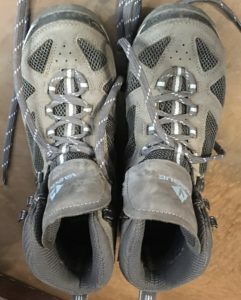 When I asked for opinions (prior to my visit to REI) I got advice from some in the trek shoe camp and then advice from the die hard boot campers. I understood how this is a tough decision. Boots support the ankles better as well as keeping rocks out. On the other hand, the trek shoes are lighter and quite possibly cooler. I ultimately decided on the boots. While I feel that my ankles are strong enough to handle a bit of terrain, ruining my trip with a possible sprain (if you haven’t noticed, I tend to trip around on plates in the gym) led me to the boots. Eventhough they’re quite light, I’m sure by the end they’ll feel like concrete and I’ll wish I had chosen trek shoes. Oh well. 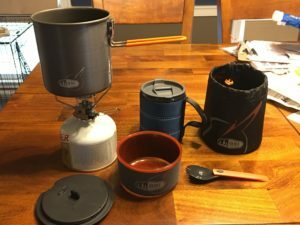 Getting the right cookware is a thing too (apparently). Fortunately, I was able to seek advice from an older gentleman at REI (because I had no idea what I needed). The gentleman pointed out to me what he uses and after explaining it all to me, I thought, if it’s good enough for him, it’s good enough for me. Sold. I’m not gonna lie, this one was a tough one for me and probably the area that made me sweat the most. For the last 11 months, I’ve led a very controlled nutrition plan with precise macros. 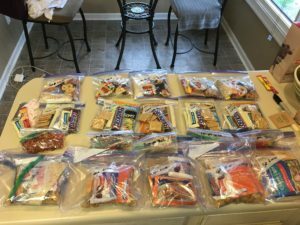 The more research I did, the more I discovered that some of the calorically dense food many hikers eat, is no where near what my world of food looks like! Plus, I was going to have to eat oatmeal (most likely) gross. I made a call to my nutrition coach for help and we devised a loose plan. Carb city! The plan is to hike 12 miles/day so with a pack on that weighs about 40lbs (hopefully), I’ll be burning through some energy. Upon his encouragement, I decided to not worry about my tightly woven nutrition plan, and to just enjoy my hike and eat as needed. Snickers bar, I’m coming for ya!! As you can see below, my food isn’t fitting in my bear canister! This is not going according to plan! This is not as hotly debated as shoes vs boots but everyone has their system they like best. I did some research and came up with two options. 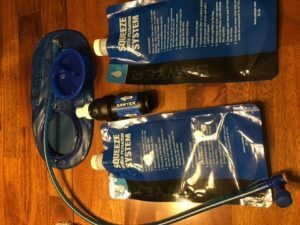 Life Straw was a very inexpensive system that I could use and get to quickly if I needed to. It’s basically a filter within a straw and allows you to drink directly from the stream. When you purchase Life Straw, the company sends one to an underdeveloped region. I love companies who do humanitarian things like this. Sold. Additionally, I added the Sawyer System. This system got a lot of great reviews as being very user friendly. That had great appeal to me!! You fill one bag with creek water, screw the filter on the end and then squeeze it and fresh water comes out! You can fill a small water bottle or squeeze right into your mouth. There is also a nozzle that allows you to fill a Camel Back through the tube. I like the convenience of the Camel Back so it’s going along too! This is a matter of personal opinion, I found. Steve and I tent camped for a number of years when our kids were young, so I knew what went into tent camping. Of course, we always had our vehicle loaded to the brim and basically moved inside the tent for a weekend. Not as many comforts of home could be carried on my back so I opted for a Hennessy Hammock. This hammock got the best reviews when it came to ease of setting up. I took it one step further and added carabiners and descending rings instead of knot tying. Hey, I know good YouTube tutorials when I see them!! I think I better get this thing figured out this week however. Sleeping bag, check. Hammock insulation, check. Camping pillow, check. During a recent visit with a good friend of ours who is a retired Navy Seal, he had a great deal of advice to share with me. I listened intently and took mental notes (when a Navy Seal give you advice, you take it)! His first advice was with regard to toilet paper and body wipes. 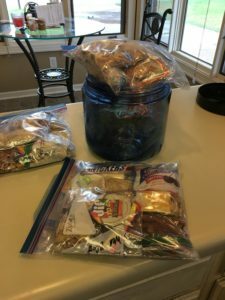 Basically, take plenty and store the toilet paper in ziplock bags in different places in my pack! Seems legit to me. He said there were always a few guys in his platoon who failed to prepare for their bodily functions and within days would be chaffed and in pain. I don’t need to be told this twice! Since there will be no showers and we will only access natures toilet, I want as little chaffing as possible. Toilet paper and wipes, check, check! 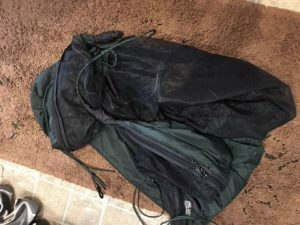 My clothing is standard hiking gear that can dry easily if (when) we get rained on. I had planned only 2 additional pairs of socks but after talking with Bob, the Navy Seal, I changed that to four. The feet are always the first to suffer. Did you see the movie, Wild? Those were some rough looking feet! I’m prepared as I know how to be, the rest we’ll leave to the learning curve. 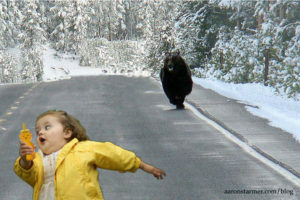 As long as bears aren’t involved, I think my learning curve will be ok! Wish me luck (prayers are good too)! Angie I have not doubt you will be prepared and will have an awesome time!! What a great adventure!! Enjoy!! Thank you Billie! I can hardly wait! !